If you are looking for a relaxed destination with unreal food, surf, culture, yoga, riding around on motorbikes thru rice fields, and watching the sunset over the temples on beaches, this is your place! Check out some of our most notable favorites. . . : CANGGU : . .
We arrived in Canggu very jet lagged and a bit out of it. We didn't have lots of time in Canggu, but we had enough time to grab motorbikes, score some awesome waves, and discover a few cafe gems: Peloton and The Shady Shack. They are both a must visit for all travelers. Both restaurants serve entire vegetarian menus, and have a very creative take on vegetarian cuisine. . . : Ubud : . .
Ubud was a quick day and a half stop over for us. 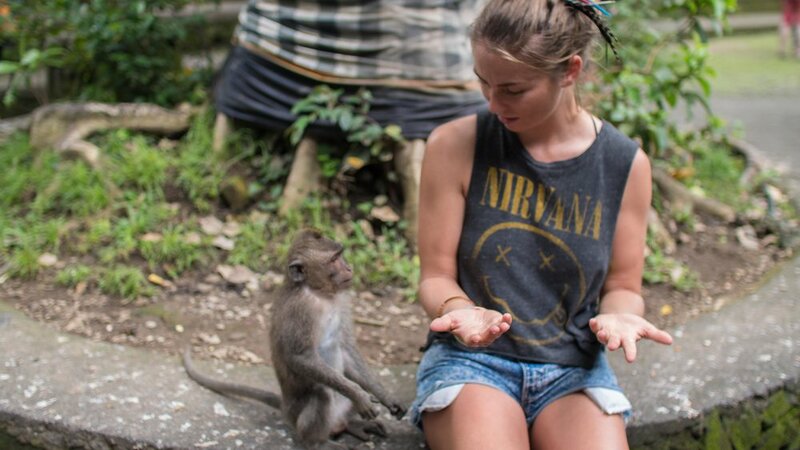 We checked out the Monkey Temple like all other tourists. 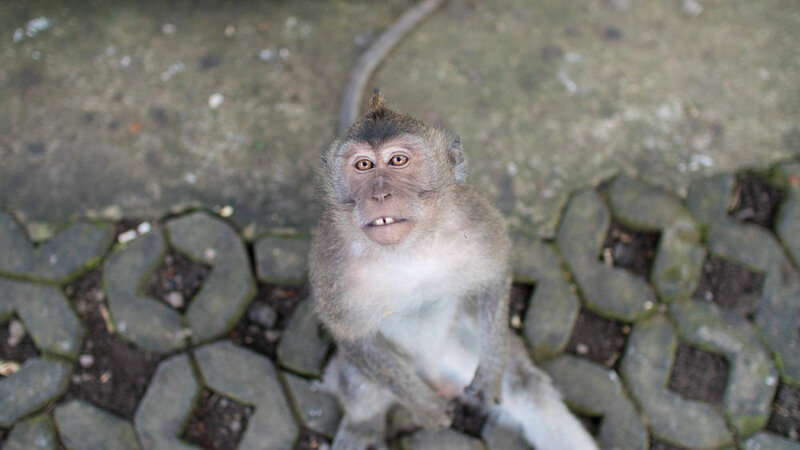 I would warn you, the monkeys are a bit scary and it can be a traumatic experience for some. We spent the rest of our day wondering the streets and checking out temples, shops, and bars. While in Ubud, we became regulars at Bali Buda which is still one of our all time favorite restaurants. This is one of the largest health food menus I've ever seen. The Bali Buda is a place for all travelers and serves a variety of food and delicious smoothies, elixirs, teas and kombucha. . . : Gili Trawangan : . . Going to this little party island is a trip. It's literally like going back in time. Upon arrival, you'll have all the locals offering you horse carriage rides to your accommodation. There is amazing and very cheap snorkeling in Gili T. Just rent a bike and snorkeling gear for around $6 and then head up to Turtle point. After you're snorkeled out, there's plenty of places to grab a Bintang or ten. We found the majority of cafes and restaurants on Gili T had vegan options. 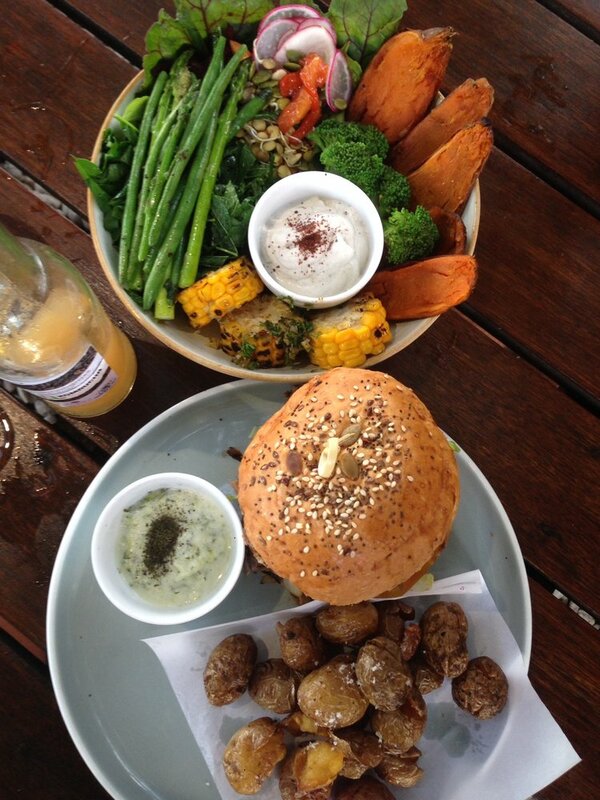 There are more delicious vegetarian cafes than you would think considering how small the place is. Our top three pics were Pituq Cafe, The Banyan Tree, and Kayu Cafe. There is a small chance of surfing in Gili T on the southeast end, but I would keep expectations in check. . . : Bukit Peninsula: . . This small peninsula was by far our favorite place in all of Bali. There's enough swell to feed the surf addicts, plenty of delicious craft cuisine and very cheap spas to keep the wives and girlfriends happy, and enough bars and Bintang dealers to keep the bros stoked and drunk. This place is a win-win for all travelers. A typical day on the Bukit is as follows... Wake up early, cruise your scooter to Balangan for a morning surf. Enjoy a post surf breakie at The Bukit Cafe. Cruise down to Bingin Beach for an afternoon high tide longboard surf session for the beginners, or if you're lucky a paddle out at Impossibles. Grab a Pitaya Bowl on the deck at Kelly's, while watching the surf start to turn on during low tide. 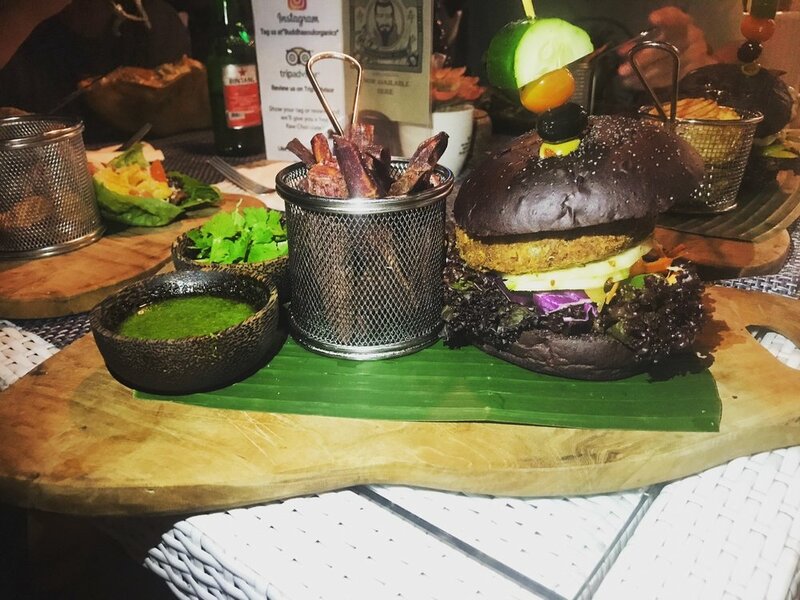 Grab the scooters and cruise over to Om Burger for a large variety of vegan/non vegan burgers with countless options. Head out for a classic Balinese sunset session at world class Uluwatu. Grab a few Bintangs on the rooftops bars that surround Uluwatu post surf. If you're still a bit hungry, head to Buddha Soul for some late night bites. 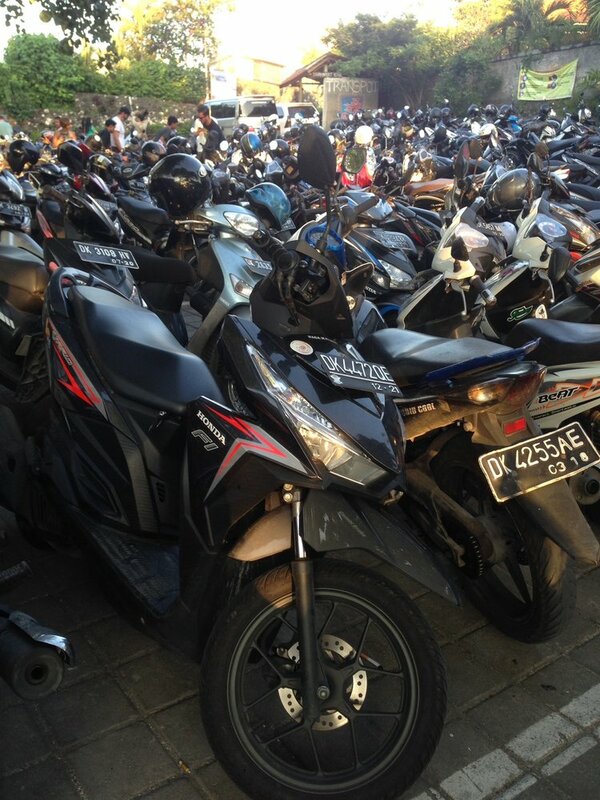 Enjoy the scooter ride back to your accomdation. Wake up and repeat. 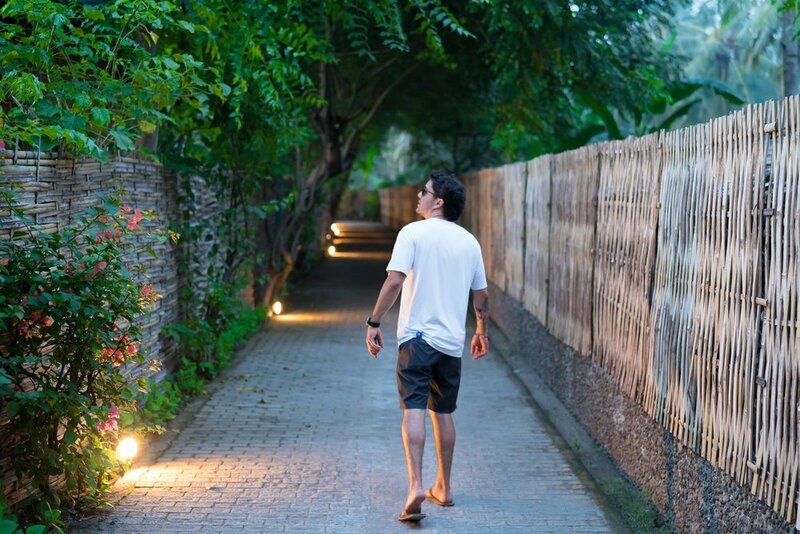 Mix it up with Cashew Tree, and a session at Padang Padang or Dreamland when the tide is going out, in the evening or early morning, the possibilities for good times are endless. Lots of people always ask me what you do in Bali besides surf and I always had the same question. But after this trip, I learned that Bali is all about exploring and discovering another culture and the best way is to dive right into it. 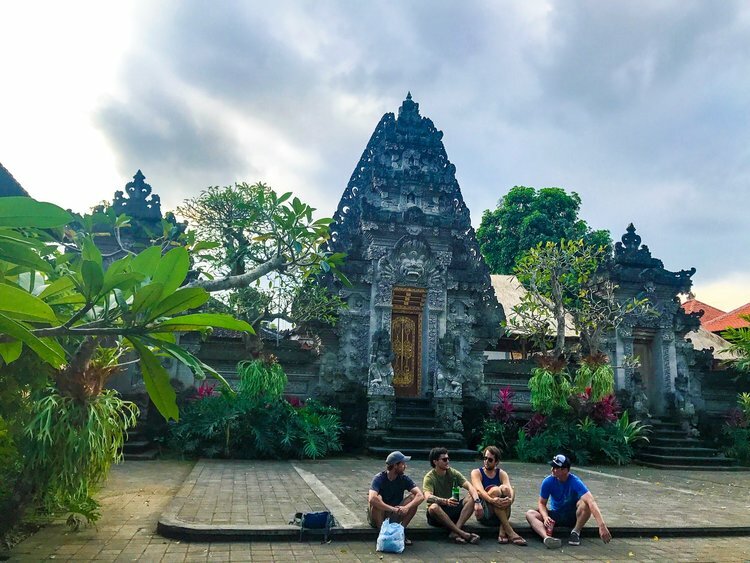 Enjoy the freedom of cruising around on a scooter across an amazing country side, meet amazing local people, visit amazing cafes, drink Bintangs, and enjoy island time.